Addiction recovery is a simple program with dynamic elements. It requires that people adopt a new way of living and changing how one looks at all things. To be sure, giving up drugs and alcohol is life-changing to say the least, especially after years of use and abuse. People new to recovery often have a sensation of nakedness, they have lost their protective armor. Mind-altering substances give people a false sense of armor, shielding you from how things affect you. Now, without the prophylactic properties of chemicals, one must stare life directly in the eye. At first, recovery seems impossible. To have to feel everything that life throws at you head-on, without any sort of damper, can seem untenable. However, in time one realizes that the program keeps you safe. When troubles arise in life, you are not alone. You have your “higher power,” sponsor and peers in recovery to process the trials and tribulations of life without having to resort to behaviors that will ultimately make matters far worse. When one begins the life-saving journey of addiction recovery abstaining from drugs and alcohol may seem like a “no brainer.” They were the symptom of your disease that precipitated you being brought to your knees. But it is not always cut and dry. When it comes to mind-altering substances in recovery there are, both fortunately and unfortunately, a few gray areas—particularly with respect to nicotine. While products like cigarettes are in fact addictive and deadly, not many will associate them with life becoming unmanageable. An assessment that is not without at least some merit. However, that does not mean that tobacco is constructive to building a new life in recovery. Nicotine is a drug, one that people turn to when they are stressed to “calm one’s nerves.” They also can be used to burn up idle time, or fulfill an oral fixation. For drug addicts and alcoholics, cigarettes or other nicotine products are typically the last thing to go. The last bastion of one’s disease, holding on to just one more release. If you were to ask people who have been in the rooms of recovery for a while they would probably say that nicotine is relatively benign. On the other hand, cigarettes can also be viewed as another defense mechanism of one's disease. While early recovery may not be the time for some to address their relationship with tobacco, it should be at some point. It isn’t easy, but it is possible and will likely strengthen your program. 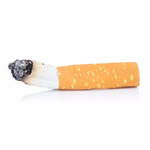 Setting the negative health consequences of tobacco aside, there is convincing research about nicotine increasing recovering addicts and alcoholics risk of relapse. Giving up everything at once may be too much of a shock to the system, but once you feel a little more comfortable in sobriety it is strongly advised that you address nicotine. Please note, that people who smoke are not guaranteed to relapse, but clear associations have been made. Which is why many addiction professionals encourage clients and patients to give everything up in treatment, where you are free from the temptations of the outside world. If you or a loved one is struggling with addiction, please contact Hope by The Sea. We can help you recover from substance abuse and any co-occurring mental health disorders that are impacting your life.